Toward Infinity began to take on a number of multi-camera projects and needed an OB provider that could supply a fly-away, multi-camera solution that suits the budgets and scope of its clients. Sidwell says, Steve at Trickbox, who Ive known for a number of years, has worked really hard to pull together a flyaway, multi-camera solution, which is ideal for us. Its something theyve honed over the last year or two and it provides a really easy and quick off-the-shelf solution. 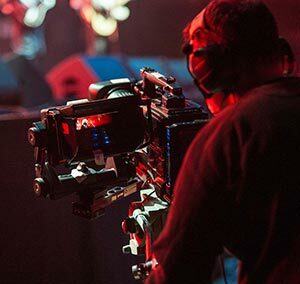 When Toward Infinity wins a project, it supplies Trickbox with the camera plan and production design and Trickbox manages the whole installation, providing the technical equipment to record the show as well as the crew to rig and de-rig it and Vision Engineers and Unit Managers as required. Rigging and de-rigging takes place on the day of the show, explains Sidwell. Thats really advantageous to us as it keeps costs down. Trickbox can rig a multi-camera shoot in the morning, get it ready for the show and then break it down and get it out of the venue by the end of the night. The camera plan and production design depend on the size of the venue and where Toward Infinity can place cameras. This isnt always easy as most of the shows are sold out before the planning process. Sidwell says, Venues like the 02 Arena are much bigger than Shepherds Bush Empire so Trickbox has to be really flexible and have the ability to run cables for any sized venue. One of the major plus points of working with them is that they have a lot of knowledge and experience. All the camera feeds, which are HD, are recorded to separate solid hard disk drives and are given to Toward Infinity so it can transfer the footage before sending the drives back to Trickbox. Sidwell adds, I take all the camera feeds and edit from those and on the occasion where we have a vision mixer, Trickbox provides the line cut straight after the show ends. This is great for me because I can then either pass that on to the client if they want to see it straight away and I can also use it as my offline edit. Toward Infinity and Trickbox have shot a number of shows at different venues including: the 02 for Status Quo, the Motorpoint Arena in Cardiff for Thunder, Brixton Academy for Bullet for my Valentine and in October theyre shooting Marillion at the Royal Albert Hall. Sidwell says, Steve at Trickbox and I have always had this dream of creating something really fluid and easy and weve kind of achieved that objective. The general output for the shows is DVD, Blu-Ray and online depending on the requirements of the end client. Sidwell concludes, Everything is shot in HD at the moment; 4K is currently budget-prohibitive but we know Trickbox is open to pioneer different ways of recording whenever were able.